Intragastric Balloons Market size is set to exceed USD 97.8 million by 2024; according to a new research report by Global Market Insights. High demand for minimally invasive surgical procedures will significantly drive intragastric balloon market growth during the forecast period. Reduction in post-operative trauma and complications with use of non-surgical intragastric balloons is the major growth driver. Reduced hospital stays, and no blood loss are other advantages associated with use of advanced intragastric balloon across the forecast timeframe. Low prices of intragastric balloons as compared to other surgical procedures will spur demand for intragastric balloon in upcoming years. Price range of intragastric balloons is very low compared to other surgical procedures such as gastric bypass and adjustable gastric banding. Low prices will lead to increasing adoption rate of intragastric balloon, thereby driving business growth during the forecast period. 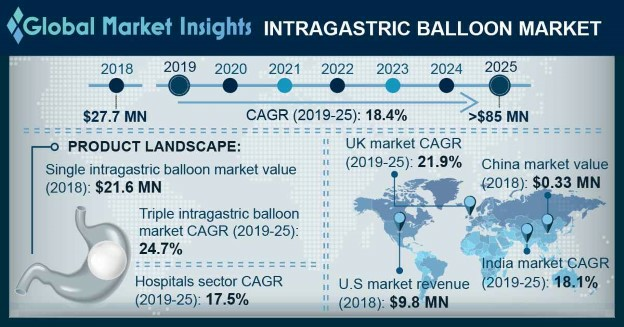 Single intragastric balloons market share was over 78% in 2017 with growth rate of 9.1% CAGR. High growth rate is attributable to growing awareness among obese patients along with increasing acceptance of non-invasive and non-surgical procedures. Ease of administration and soft silicone material offers reduction of weight in short amount of time, that will stimulate business growth. Saline filled balloon market accounted for largest revenue of USD 24.3 million in 2017. Easy detection of deflation due to methylene blue and improved ability to reduce weight will stimulate business growth. Improved design to provide maximum efficacy with minimal complications will favor segmental growth in the future. With various technological advances, saline-filled balloons segment will witness tremendous growth. Hospitals segment is expected to expand at CAGR of 14.6% during the projected timeframe. Increased preference towards hospitals, availability of skilled professionals and high funding opportunities will accelerate industry growth. Segmental growth is attributable to increase in number of patient pool seeking advanced treatment options in hospitals, thereby favoring segmental growth over forecast timeframe. UK intragastric balloons market will grow at 14.6% CAGR, owing to high pervasiveness of obesity. According to The Organisation for Economic Co-operation and Development (OECD), more than one in four adults are diagnosed with obesity annually. Adoption of sedentary lifestyle and unhealth habits are major cause of high prevalence rate. High disposable income and increasing government expenditure on healthcare will further lead to business growth in the future. China intragastric balloons market accounted for revenue size of USD 1.73 million in 2017 owing to rapid increase in the prevalence of obesity. As per national population survey in Hong Kong, approximately 29% of the total population was found to be overweight and 3.8% population was obese. High pervasiveness is due to increasing adoption of sedentary lifestyle and unhealthy diet patterns, thereby propelling industry growth. Some of the prominent players involved in intragastric balloons market are Allurion Technologies, Districlass Medical, Apollo Endosurgery, Lexel, Helioscopie Medical Implants, Medsil, Obalon Therapeutics, ReShape Medical, Silimed and Spatz. These firms adopt strategic initiatives including mergers and acquisitions, new product launch and geographical expansion. For instance, in December 2015, Allurion Technologies received CE mark for its Elipse Gastric Balloon. The approval permits the company to sell the product in the European Union, thereby expanding its customer base and strengthening its market position.